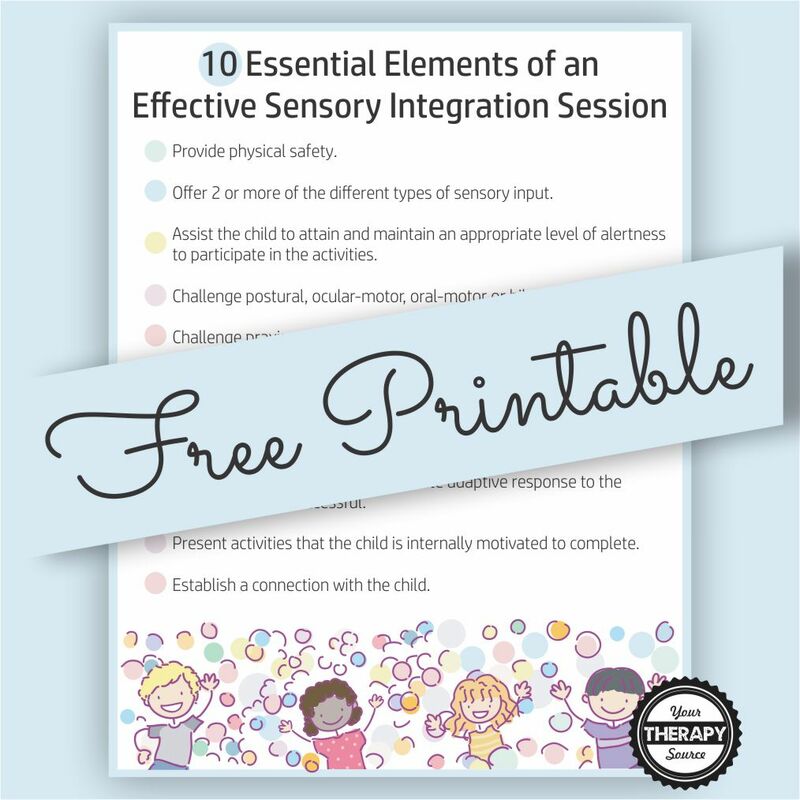 Whether you are a seasoned therapist or a beginner, this Free Poster – Strategies for Effective Sensory Integration Sessions provides a visual reminder to help children achieve functional goals during a sensory integration session. You can download it at the bottom of the post. Why this FREE Visual about Sensory Sessions? It came to our attention that a previous blog post about 10 essential elements of an effective sensory integration session was very popular. If you are a experienced pediatric OT or PT, you know that effective treatment sessions are sometimes difficult to master. Especially for a child with sensory needs, where it can feel and look like a child is all over the place. Having a plan in place is crucial. The 10 steps to an effective sensory integration session are listed below. This list of 10 process elements reflect key strategies from the Ayres Sensory Integration and was developed as part of the Ayres Sensory Integration Fidelity Measure. Read the complete study on the Development of a fidelity measure for research on the effectiveness of the Ayres Sensory Integration® intervention. Provide physical safety – make sure that the environment is safe for the child including any equipment being used. Offer 2 or more of the 3 types of sensory input ie proprioceptive, tactile, vestibular, etc. Assist the child to attain and maintain an appropriate level of alertness to participate in the activities. Challenge postural, ocular-motor, oral-motor or bilateral coordination. Challenge praxis, motor planning, and organizational skills. Provide activity choices for the child. Offer just-right challenges by modifying the task based on the success of the child. Make sure the child has an appropriate adaptive response to the challenge and is successful. Present activities that the child is internally motivated to complete. Establish a connection with the child. Need more details on effective sensory integration sessions?